As the summer heat beats down on us, it is important to stay cool this season. Especially for those of us who go from the heat outside to an even hotter workplace, like a kitchen. That’s why we’ve decided to come out with mesh chef coats in different styles, so that everyone has a chance of staying cool, even in front of the stove. At ChefUniforms.com, we know just how hot it can get while you’re cooking, and the last thing you or your customers want is for you to be sweating all over the place while you’re preparing their meals! 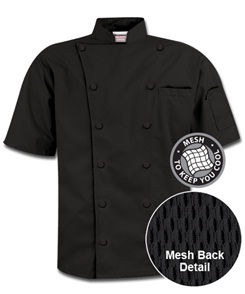 So why not cool off with one of our chef coats that were specifically designed to keep the wearer from overheating? You can cook in style – 6 different styles, to be exact – and even personalize your chef coat with your restaurant’s logo. But why stop there? We’ve also got mesh chef hats to keep your head cool and your hair covered. This summer’s heat has been record-breaking, so it’s important to stay cool as much as possible. That’s where our mesh chef coats and hats will come in handy. There’s nothing like a cool breeze while you’re working next to a hot stove and wearing thick material. So think about that the next time you get sweaty walking from your car to your front door, and head over to ChefUniforms.com for a new chef uniform today!